A toasty dark red anyone? Old friends, new adventures. We have a holiday fund, my oldest pals and I and we contribute regularly but getaway rarely. So when we do, let’s just say we make it count. And we don’t do it by halves. Why the hell would we? Like so many of you, we’re working Mums so it’s not easy to carve time out like this. This was our 48 hours. We were gonna make it count. (Hungary’s capital is bisected by the River Danube which divides hilly ‘Buda’ and flat ‘Pest’). Language: Hungarian although English is widely spoken. Currency: Hungarian Forints (€1 is equal to about 323 forints). Thankfully my friends are very organised and one or two of them in particular (Mairead/Denise!) did some solid groundwork on hotels and restaurants so the rest of us were the beneficiaries of their thorough research. We arrived around teatime and checked in to the music-themed Aria Hotel. This was, much to our delight, a lap-of-luxury five-star hotel but thankfully without the five-star price tag that we’re familiar with here. Yay! About the hotel – Aria hotel – part of the Library Hotel Collection. What a perfect base this contemporary, glorious hotel made for. We were upgraded (double yay!) to a jazz-themed suite (I hate jazz but not enough to turn down an upgrade that involved further luxury!) so we happily sucked up the jazz illustrations for the gigantic suite and free champers! The staff here are excellent and can’t do enough to help you make your way around the tourist attractions, ensuring at all times you have maps and the local info to hand. 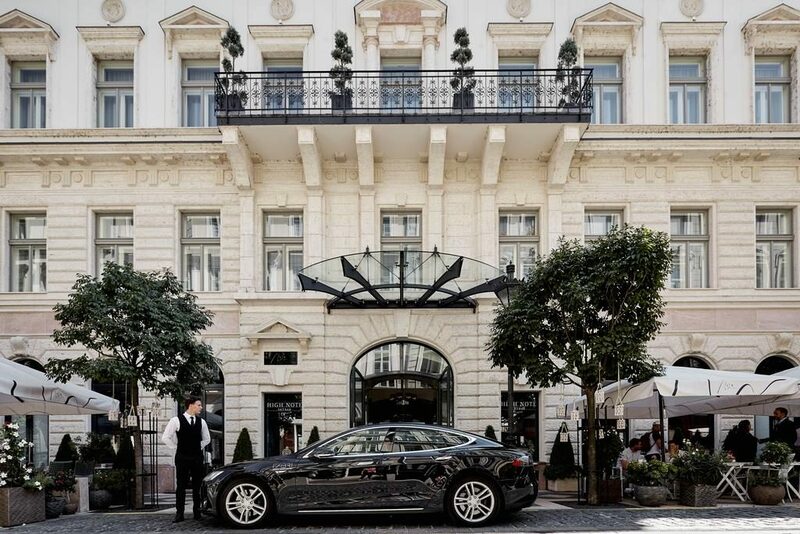 Located in the shadow of St. Stephen’s Basilica while the beautiful state Opera House is five minutes away, this is undoubtedly one of the most fabulous hotel offerings in Budapest with a perfect location. There’s music everywhere here at the Aria Hotel with nods to the greats like Bob Dylan and James Brown and cutting edge tech to listen or watch your music of choice in the comfort of your own room (or suite!). I’ll tell you about their rooftop bar in the below, it’s one of the finest. The hotel offers gratis tea and coffee which are served with cookies and fruits during the day and…and this is the real sweetener, a free cheese and wine reception is available EVERY afternoon from 16:00 to 18:00. We may have let out a little yelp of delight when we discovered this bit of news!! On the first night, we had a recommendation for a nice restaurant called Klassz and it gave us the chance to go walking and explore the city a little. 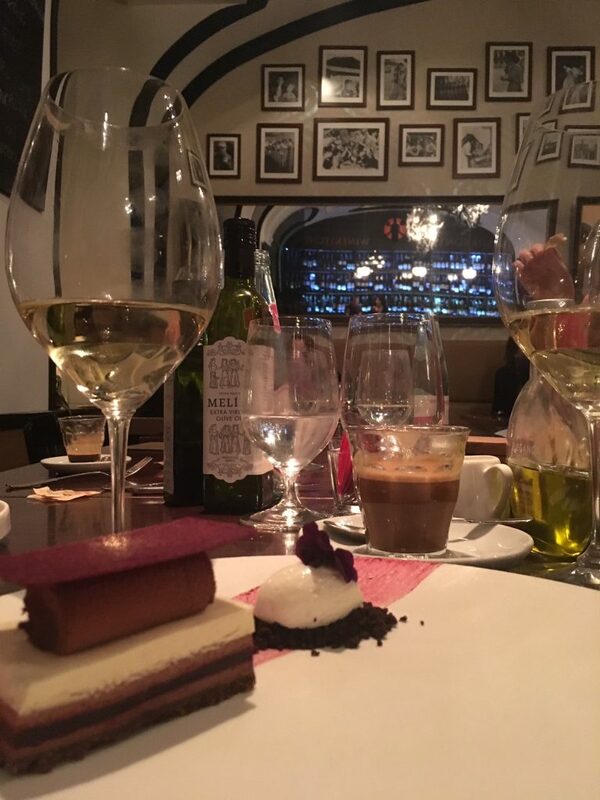 The small wine bar and restaurant serving European style dishes was a nice spot if a little sleepy. We were about to make up for that though! The only way to get a sense of a new city I always think. 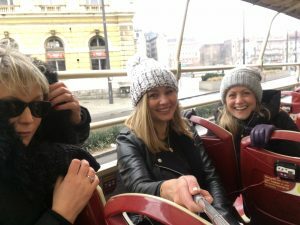 We were all in agreement that this was the perfect place to start; a hop- on, hop-off bus ride with ‘Big Bus Budapest’ and although a little wet on the open top deck of the bus, it was well worth it to enjoy the most beautiful sights and incredible architecture. We were staying in Pest (the more touristy side) but you get to see the hilly Buda too. The Hungarian Parliament Building stands on the banks of the Danube and provides serious wow factor, located on the Pest side of the city it’s notable for its huge scale alone – with its precious stones and gold features, it is show-stoppingly opulent and it’s the third largest parliament building in the world. The Opera House, St Stephen’s Basilica and the Fisherman’s Bastion are standout architectural structures that you need to see on this trip. Fisherman’s Bastion is situated on the Buda bank of the Danube, on the Castle hill in Budapest, around Matthias Church. It was designed and built between 1895. A spot we couldn’t resist…the most beautiful tea rooms in the world! One of us spotted the New York Cafe while the traffic was at a stand-still and with a few quick glances and even fewer words exchanged we were off the bus and in the queue for what looked like the finest coffee house you’ll ever stumble upon. Turns out it’s a palace, a world-famous tea rooms called the New York Cafe and is part of the Boscolo Hotel. There was a wait but we were happy to join the queue and drink in the opulent surroundings. As an orchestra played, tourists took photos of elaborate ceilings and Venetian chandeliers. Fair to say this place was insta-ready! 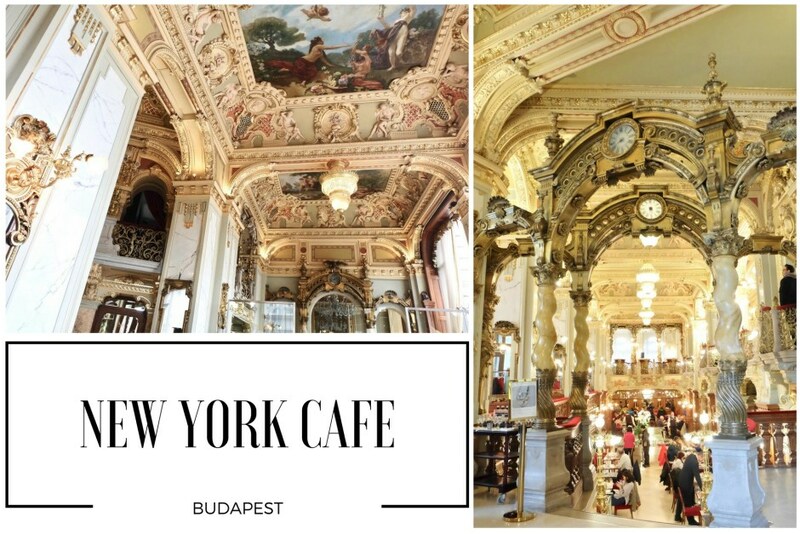 Turns out it was once the meeting point for Budapest’s literary and artist types when the building was first built in the 19th Century as the New York Insurance Company. We enjoyed a mix of Irish and French coffees and even tried the local fruit brandy, Palinka! It was a heavenly afternoon of chats and laughs in the most opulent of tea rooms. With four Michelin-starred restaurants in Budapest, Borkonyha isn’t your usual super-slick Michelin experience. This is a comfortable, no-notions spot but no one could suggest the food offering is anything but perfect. 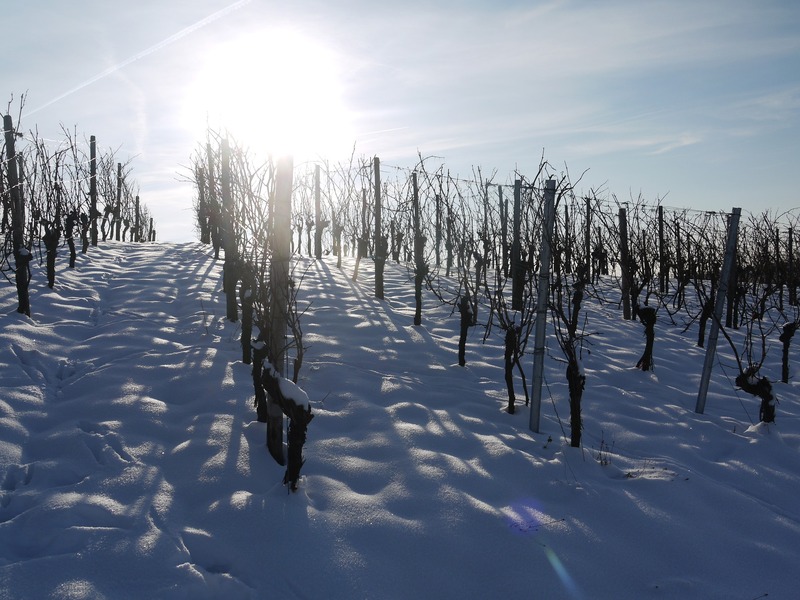 With a selection of over 200 local Hungarian wines to choose from, it’s fair to say we were in gastro heaven! The bill, for the record, was nothing like you’d expect to pay in a restaurant boasting a Michelin-star. I referenced the rooftop bar at our hotel above. 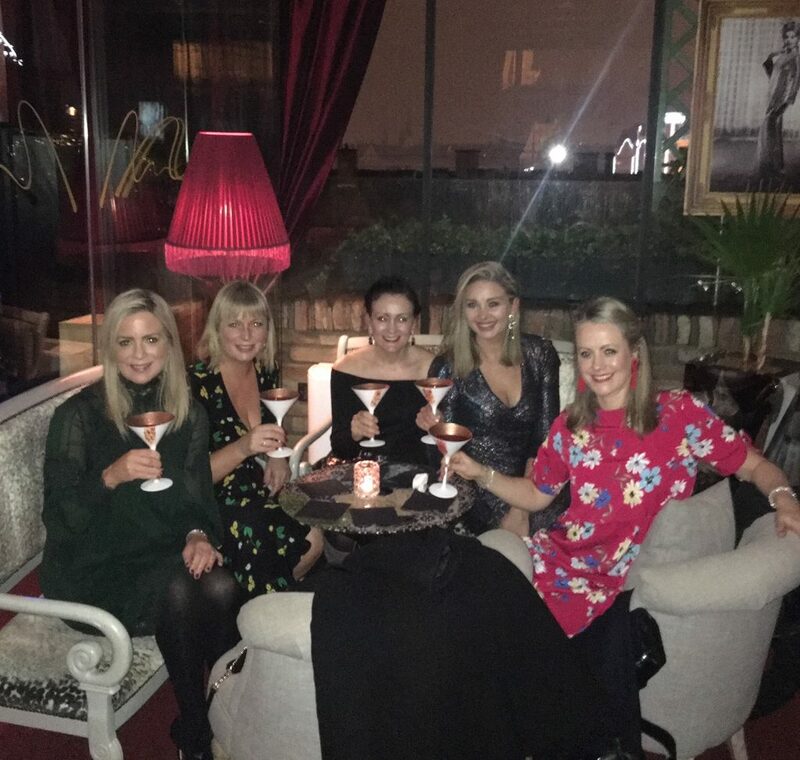 Well, the High Note Sky Bar is listed as one of the best rooftop bars in the world so we started our night here with ‘prinks’ and we may have finished it there too. If memory serves me correct!!! 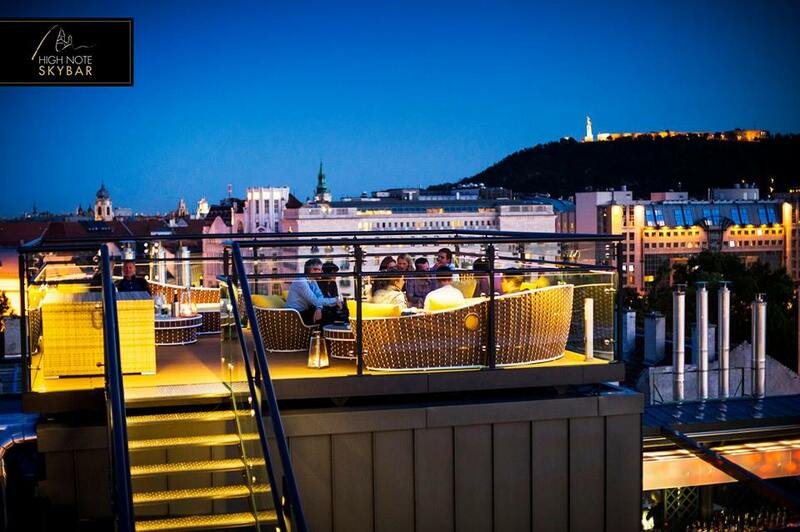 Voted one of the top 10 rooftop bars in the world by travel bible Conde Nast, it’s easy to see why. Bear in mind it was November and we could barely get any outside vista but the atmosphere and the glamour inside were more than enough! 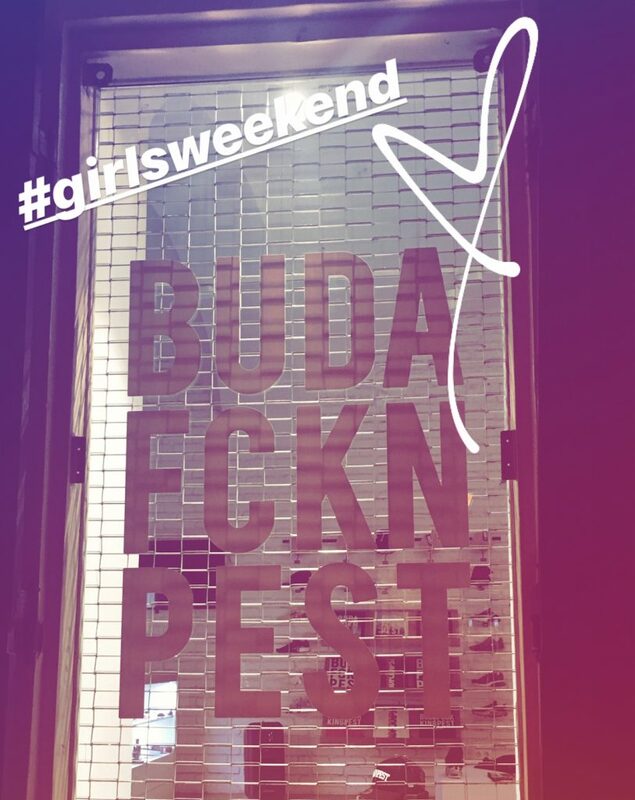 After chatting to a bunch of girls en route to a lively/messy hen party in Budapest on our way over I was left in no doubt that we needed to hit a ruin bar. Or several ruin bars. These are bars that now occupy dilapidated buildings and are a firm fixture on the ‘Pest’ party scene. It’d be rude not to occupy one or two ourselves we thought! I’d love to tell you which ones we occupied but that might be a stretch! I can tell you there was a broken high heel involved (always a sign of a good night, right?!) and different areas with everything from jungle to reggae so something for everyone. No jazz though. Thankfully! The Perfect Hangover Cure….A Visit to the Baths! 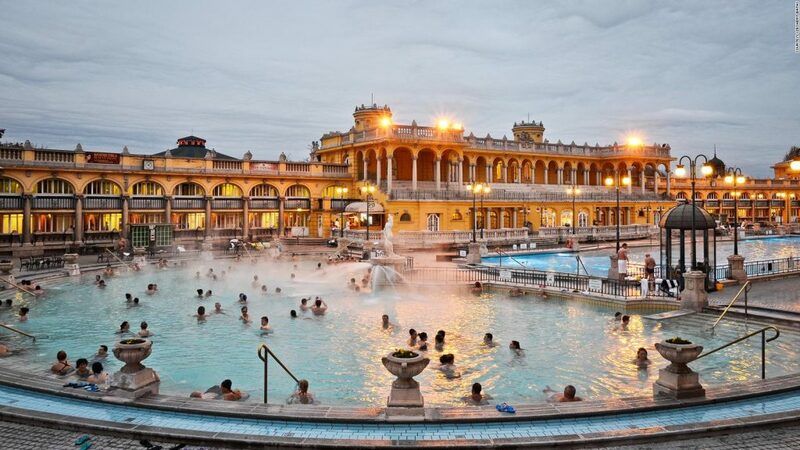 Since the Roman times, the locals have been taking to the waters and these thermal baths are dotted all over the city and majestically appointed in many cases. They all seem to boast Roman columns and elaborate tiling and sculptural elements while often you’ll see the locals playing a game of chess in the water. As you do! Our hotel guided us to the nearest one called the Rudas baths, established back in the 16th century during the time of the Turkish occupation. We headed for the rooftop bath which had amazing views of the city. The perfect cure overlooking the Danube from the hot thermal waters on this cold winters morning. Did someone mention shopping? And food? Street markets are a thing all year round in Budapest but I’d heard lots about how special the Christmas markets are and they really didn’t disappoint. We took a few strolls through them over the course of our trip but I set aside a couple of hours before we left to properly explore them. From their famous ‘Chimney Cake’ to intricate local crafts it was a feast for the senses. Between twinkling lights and incredible architecture, there are stall holders all trading their wares without any pressure to buy, just friendly faces happy to chat and serve you should you wish. I enjoyed the most delicious hot chocolate I’ve ever tasted while strolling around and a little later tucked into delicious sweet potato fries from another trader. There’s street food on offer here that would give most good restaurants a run for their money and the most unique hand-crafted gifts at very reasonable prices. If, like me, you’re a shopper/potterer, you’ll spend hours in a place like this and enjoy every moment. Enjoying some mulled wine, the unique hand-crafted decorations, chocolate displays and the traditional ‘Chimney Cake’ at the Budapest Christmas Markets. So, to summarise if you’re looking for a five-star getaway on a slightly more modest budget, this is the perfect weekend getaway destination. Whether it’s a romantic weekend away for two or a girlie get together, there’s good reason why George Ezra tells us it’s his hidden treasure chest! Golden grand piano…My beaut-iful…you get the picture.